Underwater inspection of Floating Offshore Installations (Production and Drilling) using divers and work classed ROVs is costly, uses significant POB, creates unnecessary safety risks, delivers poor quality information and disrupts normal operations. EM&I have developed and proven an alternative approach which is Class approved and have completed fourteen ODIN projects to date with the earliest project now more than five years old. 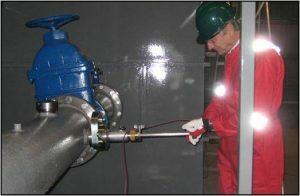 ODIN uses advanced methods to plan and carry out the required structural, isolation valves and other required inspections from inside the hull. Sea chests and isolation valves are inspected using CCTV systems inserted via special inspection ports that can be fitted on new or operating assets, safely. ODIN can be aligned with the Hull Continuous Survey programme which means that the UWILD costs are spread over a 5 year period and only one entry per tank is required, leading to minimum costs and operational disruption. ODIN has proved to be a flexible system covering inspection, piping and valve repair work scopes and now corrosion protection of vulnerable components such as piping and sea chests by installing sacrificial or ICCP anodes via the ODIN ports – all without using divers.